At Trinayani, for the cause of disability awareness we do not restrict ourselves only to exploring the media or conducting workshops. We have tried never to miss an opportunity to participate in or organize events which would help us further our cause. In doing so, we have been a part of several events which cannot be strictly labeled or categorized into neat boxes. In this page, we have gathered together some such events with the hope of adding to it in the future. 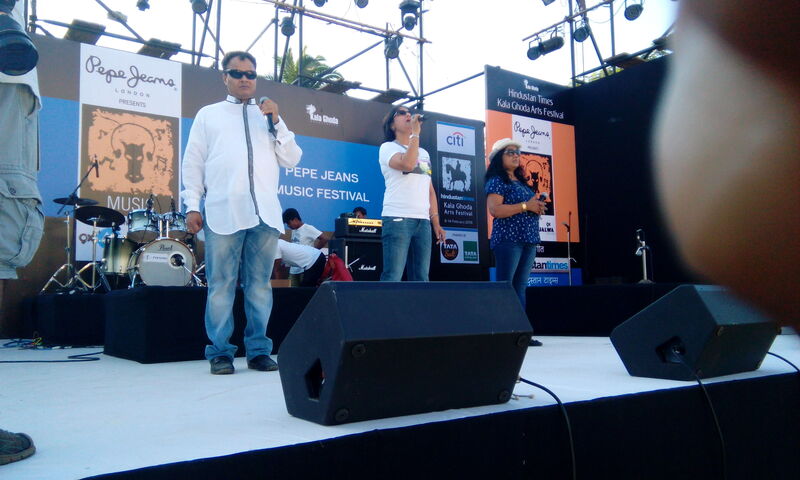 Our NGO Trinayani participated in the Kalaghoda Festival 2016. Trinayani commissioned the ‘Let’s Talk’ sculpture, a product of our first National Inclusive Visual Arts Workshop Triumph Together in association with Khoj International, in Kolkata .The sculpture (32 inches high, 22 inches wide and 21 and half inches deep) created in Fibre Glass has been crafted by Shri Hasmukh K. Angari who is Deaf-Blind, Shri Shankar M. Bhoya who is an Artist and trainer (both from Ahmedabad) and Shri Nantu Behari Das, a professional sculptor from Kolkata. It has been created projecting Alphabets in American Sign Language the mother tongue of many deaf and deaf blind persons in our country. 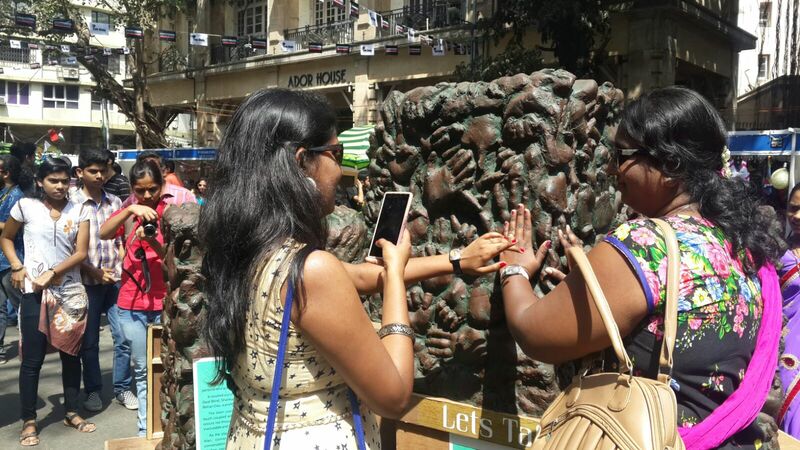 We had an installation of 5 “LETS TALK” sculpture on Rampart Row as part of the Visual Arts initiative from the 6th till the 14th of Feb which allowed us to talk about the world of persons who are deaf and deaf-blind. Trinayani’s Inclusive music Band PEHLI BAARISH comprising of disabled and non disabled artists also performed on the 11th of February at Cross Maidan from 5.30 to 5.45 pm. A 15 mins performance on karaoke tracks by Compere Kishor, Singers Mangala and Sandesh who are Blind and Ritika. Our Founder Trustee Ritika Sahni who is also a singer performer is conducting the RHYME AND RHYTHM workshop titled HALLAM CHALLAM on the 7th of Feb at Museum Gardens from 4 to 5 pm. In a very friendly and affectionate ambience, this workshop gives an orientation to children to playfully sing, dance and make meaningful gestures TO SOME ORIGINAL NURSERY RHYMES & SONGS, including learning a few phrases of SIGN LANGUAGE. Her Albums for children will be displayed too. 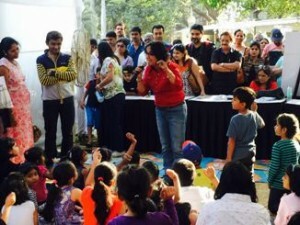 To view more photographs of the Trinayani picnic and the celebration of the second anniversary of Sparsh, click here. To view more photographs of the Standard Chartered Mumbai Marathon, click here. At Trinayani we are always looking forward to your feedback, requests and areas where we can collaborate to make difference. Please feel free to click here to connect with us. Trinayani is a Registered Indian Non-Profit Organisation headquartered in India that works incessantly for creating awarness about disability. We look forward to your support and to serve you in any way possible. BEING AWARE: Make India Accessible.